View our newly updated interactive to see the top inflows and outflows of money sent by migrants worldwide. Worldwide, an estimated $582 billion was sent by migrants to relatives in their home countries in 2015, a 2% decline from 2014, when the amount was $592 billion, according to economists at the World Bank. This is the first drop in global remittances since 2009, when they fell by $28 billion amid the global financial crisis. Despite this recent decline, remittances sent by migrants are still about double what they were a decade ago, before the sharp decline in the global economy during the late 2000s. 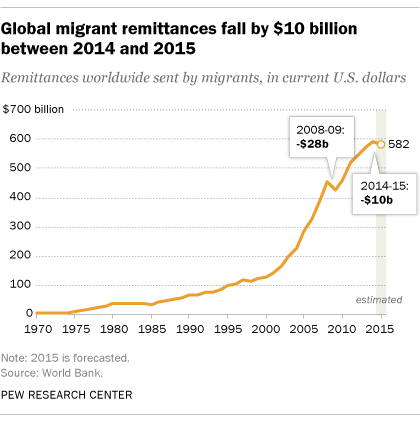 And, with the exception of 2009, migrant remittances worldwide have steadily climbed since the World Bank began releasing estimates in 1970. 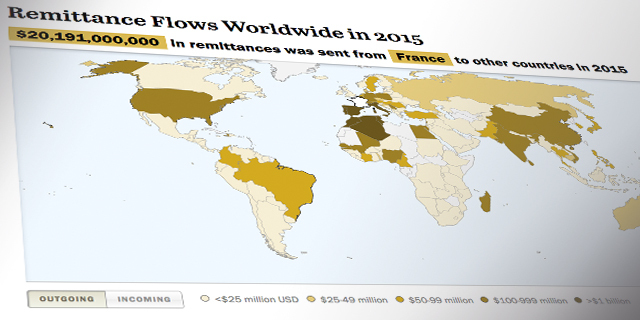 View our newly updated interactive to see the top inflows and outflows of money sent by migrants around the world. Oil prices are affecting the global level of remittances. For example, some top remittance-sending countries like Saudi Arabia, United Arab Emirates, Kuwait and Qatar are oil-rich nations that saw their economic growth slow in 2014 and 2015 as oil prices fell. This has left thousands of migrants jobless. As a result, preliminary evidence suggests remittances to India fell between 2014 and 2015. Overall, an estimated 8 million Indian-born migrants (or about half of all of India’s emigrants) live in Bahrain, Kuwait, Oman, Qatar, Saudi Arabia and UAE as of 2015. Migrant remittances can also move up and down as the economies of countries that are highly dependent on migrant labor fluctuate. For example, remittances sent by the large number of migrants in Russia have fallen sharply recently. In particular, remittances from Russia to neighboring countries like Turkmenistan and Uzbekistan dropped by nearly half between 2014 and 2015. This decline is particularly significant since remittances were equivalent to about a quarter or more of some Central Asian countries’ gross domestic products in 2014. One of the unknowns of remittance trends is how the recent refugee crisis in Europe and the Middle East may affect the sending of money around the world. Given that nearly one in 100 people are displaced worldwide within and outside their countries of birth and 9% of all international migrants are refugees, estimates for flows of money back to or from their home countries are largely unavailable.